Still dealing with jetlag, we had a burl around IDEAL and I can’t quite put my finger on why it seems more enjoyable dancing here in BA. Even amongst the “Golden Oldies” (maybe I’ve become one). I think it could be that most of the dancers on the floor tend to become more as one, rather than the “I am an individual” concept back home. Whether this is borne from a greater consideration of other dancers on the floor which might be called manners, I’m not sure about. But I found that my concentration on the music and my partner was not continually interrupted by some dancer challenging my dance space. The difference was particularly striking as the night before departing Australia, we attended a milonga in a really nice setting in Bexley, Sydney. Like so many of the major milongas that I’ve attended in the past year or so, protecting my space and partner took away from connecting with the music and the person in my arms. 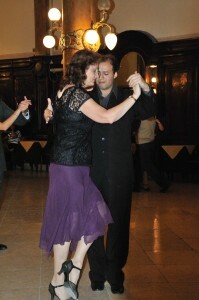 I really don’t think that the tango cultural chasm between Buenos Aires and elsewhere can be bridged. I have resolved to calmly dance behind everyone and resist overtaking no matter how slow the progress – to let slow increase my sense of feeling. IF STAYING IN SHARED ACCOMMODATION…plastic cup, plate, bowl. Cutlery for 1, incl sharp knife. Keep them in your room. Not everyone washes kitchen items well & it’s a fast way to transmit colds & flu. IF STAYING IN AN APARTMENT…If you want to cook, [I cook big tubs of stew and soup, and put in freezer, great when you come home tired and hungry] bring along a packet of your favourite herbs & spices, and pepper to sprinkle on your food, along with gravox,custard powder, lime jelly, peanut butter, vegemite, french onion soup for thickening soups etc, pepper is completely unobtainable here. It’s nonexistent in cafe’s too. thermal tank top & camilsole – you will need them! A fan – it can still get warm dancing, even in winter! IN SUMMER… a fan for each shoe bag you take, so you don’t forget it! The Subte – trains are frequent & a quick efficient way to get around – price $1.10 per trip, they are often very crowded in peak hour, there is always someone who will want to sell you something and it is common practice to give up your seat for an elderly person, pregnant mother or a mother with a child. NOTE. The trains cease service at 11pm. The Buses – Also quick & efficient, they are a 24 hour service – price $1.10 with a max of $2.00. The timetable book is widely avaiable at any newspaper stand $5.00p NOTE. Only coins are accepted on buses. The vast majority of streets in Buenos Aires are 1 way, it’s advisable to stop walking at all corners, pedestrians do NOT have right of way, the drivers do not always use indicators, but will sometimes toot their horn on approaching a corner. The blocks are square, with house numbers of 100 to each block and the house numbers are of an identical type, always there and visible. Residential blocks use the intercom system to open the doors. Quite a lot of small businesses keep their doors locked at all times and you have to buzz or knock to be allowed in. Pollution is a problem, so be prepared if needed. Seeing that the comfort-fit tango shoes I’d bought this trip made dancing better, I’ve gone out and bought 2 pair of tailored “Tango Pants”. The owner of Fattomano Shoes, gave me the name of a tailor who apparently is used by all the top male dancers. I figured that the tailor shouldn’t be able to tell that I’m at the other end of top, and fit me into a couple of pair of good duds. After a lot of time selecting the material (don’t take a woman with you), a small amount of measuring (no inside leg stuff), and an interval of about 4 days, I went back for a final fitting. Perfect fit. I made sure I took dancing shoes so the correct length could be pinned up. And in 2 days I’ll again make the trek out to Flores Barrio to pick them up. Now, equipped with top shoes, slacks and shirt I’ll be able to impress until I actually walk onto the dance floor. And to top it off, the tailor is Italian, so I can even brag that I have Italian made pants. One cockup I should have avoided was to check for their opening hours. It totally escaped me that they close between 12.00 noon and 3.30pm. It’s not much fun walking the streets in a strange and not too tourist friendly looking barrio for a couple of hours. Karen and Pablo get in a bit of quality dance time before the milonga gets crowded. 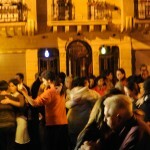 Since arriving in April 1, I’m 99% certain that every milonga I have attended has had at least one chacarera tanda. And the floor is always full with eager tangueros. Even the floor at La Marshall, the gay milonga, was packed with people who were suprisingly young and full of furver for such a traditional dance. Maybe the young are planning on preserving the traditional roots of tango too. Last night we went out our front door, into the Plaza Dorrego for a bit of tango dancing in the beautiful open air environment of the plaza, and to watch a qualifying heat of the Tango Championships to be held later this year. 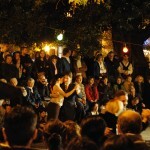 At the interval of judging, three chacarera tandas were played and the audience and competitors alike jumped at the chance. The old with the young. Over 60 people in two lines in a floor space about half of Brisbane State School venue. It was something to behold – I’ll remember the occassion forever. So when I get back I’m hoping there’ll be enough interest to get it started again in Brisbane. I’ve included a couple of pics from last night down at the Plaza. Do Tango shoes make you dance better? I’ve taken possession of 2 pairs of hand made shoes from Fattomanos here in BA. Unlike previous purchases in recent years, I went for total comfort with complete disregard for style (I’m a bloke by the way). I included my orthopedic inserts and all into the design. I wanted my broad foot to still feel broad inside the new shoes, and allow me to wriggle the toes, unlike most of my other orders. I indulged myself with an otherwise very bland design, by adding a colour to otherwise totally black shoes. One’s got a splash of grey and when I went to pick them up, blood rushed to my head by the sheer comfort of them on, and I ordered an exact replica but with a splash of red. Took me a couple of weeks to work up the courage for a public appearance. The shoes have made a tremendous difference to my dancing. More comfort and definitely increased balance. Beginning to wonder if pink might be too much! Compared to my 1st visit, many of the old time locals seem to be ignoring the normal dance floor etiquette on which they used to pride themselves. Maybe the foreign influence has got to them. They’ve just got sick of us gringos muscle-ing them on the floor. Now they quite happily back step up to three steps, perform unsuitable routines on a tight floor, don’t progress with the rest of the floor, weave in and out and display an increased aggression. Maybe not all that many, but enough of them to affect the dance. I get the feeling they are getting a bit fed up with the continual bomardment of foreigners. 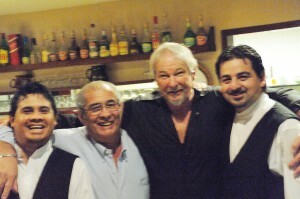 Ever since my 1st visit to BA in 2007, El Arranque has been my tango home while here in BA. Juan Carlos and the guys are just great. 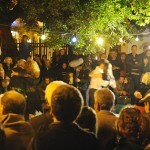 Tonight there’s the usual free open air milonga in the picturesque Plaza Dorrego in San Telmo Buenos Aires. 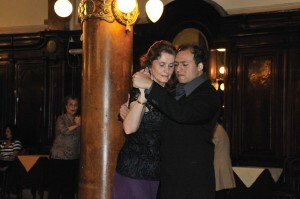 It’s hosting a qualifying round of the Tango Championships held later this year. In the last week the weather has decidedly developed a winter complexion, so maybe the event won’t attract a lot of entrants or spectators. We’ll wait and see. Pity really as the weather since we arrived April 1 has been T-shirt stuff, day and night; never a cloud in the sky, or a damp moment from rain. That’s quickly changing now.